750mm Men at Work Q Sign The Q Sign is a temporary plastic road sign manufactured from recycled..
Men at Work Q Sign c/w End 750mm. 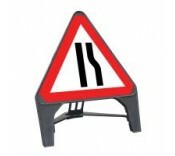 The Q Sign is a temporary plastic road sign manufactured fro..
Men at Work Q Sign c/w Arrow Left 750mm. The Q Sign is a temporary plastic road sign ..
Men at Work Q Sign c/w Arrow Left 750mm. The Q Sign is a temporary plastic road sign manufactur..
Road Narrows Nearside Q Sign 750mm The Q Sign is a temporary plastic road sign manufactured fro..
Road Narrows Nearside c/w Single File Traffic Q Sign 750mm The Q Sign is a temporary plastic ro..
Road Narrows Offside Q Sign 750mm The Q Sign is a temporary plastic road sign manufactured from..
Road Narrows Offside c/w Single File Traffic Q Sign 750mm The Q Sign is a temporary plasti..
Keep Left Q Sign 750mm The Q Sign is a temporary plastic road sign manufactured from recycled m..
Keep Right Q Sign 750mm The Q Sign is a temporary plastic road sign manufactured from recycled ..